Shown here are my fellow Headache on the Hill participants as we talk to a staffer from Congressman Don Beyers office from VA. I was so incredibly proud of how well our group was able to mesh together to get our message across. Two of us had chronic migraine, one had cluster headache, two were caregivers and one a headache specialist. I have to boast about my friend Monica who had asked me months prior if she could go with me to Headache on the Hill. She’s only experienced one migraine in her life. After her second son was born she had excruciating head pain that would only improve if she laid down. After five days of agony it was discovered that she had a lumbar puncture from the epidural she was given during childbirth. Spinal fluid was slowly leaking out, causing this migraine attack. The cure was for her doctor to perform a blood patch in order to stop the leak. While the experience was incredibly painful, Monica told me that the silver lining was that she could relate more to what I was going through. 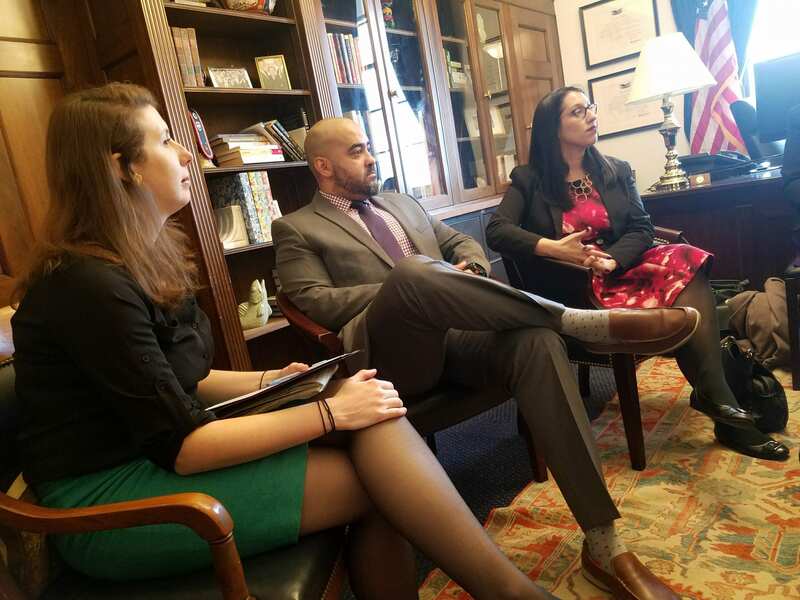 As someone I consider a caregiver to me, she was able to tell staffers on Capitol Hill what extreme impact chronic migraine has had on my life. She’s known me before and after I became chronic. I am truly blessed to have her in life as well as a host of other family and friends who are sensitive to my condition. I know that this is a luxury many others in my shoes do not have.